When I made this, the wisteria was still blooming outside of our kitchen window. The weather was warm, the smell was divine and we kept the window open all day to make the most of that warm, scented spring breeze and lovely view. Every now and then, I cut off some of the flowers and livened up our table and my blog photos. Now the flowers are gone and it has been raining and chilly. Our beautiful wisteria has gone back to being a flowerless nuisance, getting tangled in our rolling shutters, crumbling the stucco of the building façade and the paint on the pre-war wooden fixtures, attracting pigeons to nest in, and making our kitchen pretty dark. I will admit that it helps keep the room cool in the blazing summer heat, but it also unfortunately hides the view of our building's quaint courtyard and magnolia tree. But that is the cycle of life, of nature, is it not? And what makes it all the more special: nature shows itself for an instant in all of its ravishing, fleeting beauty, only to leave us with the memory of what was and what can be, for the rest of the year. Luckily nature, besides providing vegetation with transient beauty, also offers a great variety of plants for our everyday nutrition. Some of these less-known varieties - like farro, which has been around for millennia - are experiencing a comeback. A farrotto is simply a risotto made with farro, or if you prefer, farro made using the risotto technique. You can use pretty much any ingredient to make this, just as you would in risotto, but here I used the most humble of pantry ingredients, canned tomatoes. Heat some olive in a pot. Peel and dice/sliver the onion and garlic. Cook them in the olive oil on a low flame, until the onion is soft, then add the anchovy filets. When they have melted, raise the flame a little and add the chopped tomatoes (or you could add the farro beforehand to toast it a little). 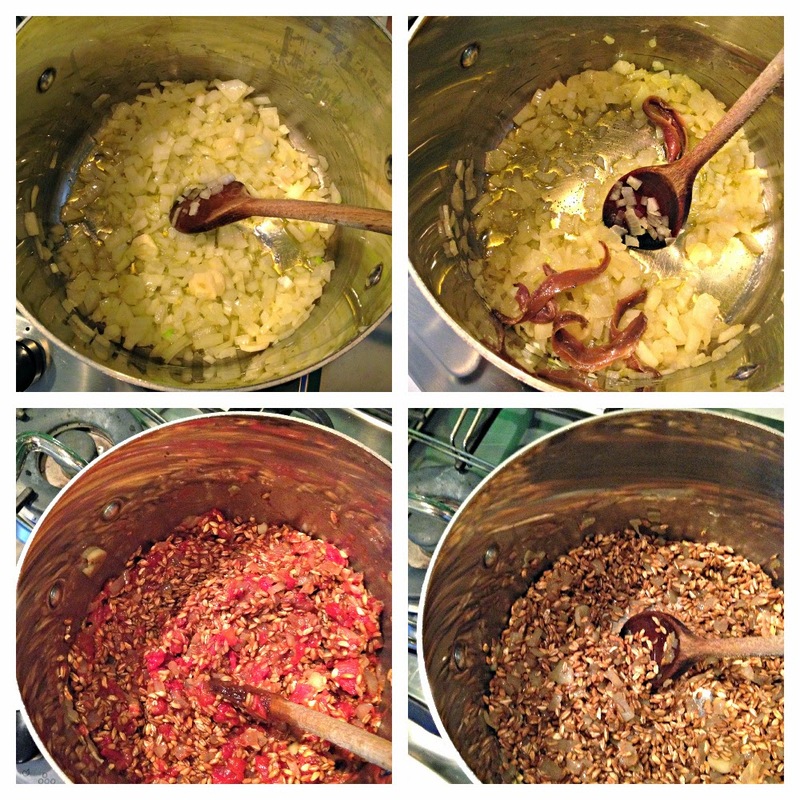 When all the flavors have melded, pour in the farro and start making the farrotto, by adding a little stock whenever the grains have absorbed most of the liquid and stirring a little. Constant stirring is not necessary, because the grains do not release starch like white rice would. Also, the hull doesn't stick as easily to the bottom of the pot. When the farro is ready (keep tasting, but it will remain al dente, with a little bite), serve immediately sprinkled with Parmesan cheese, freshly ground pepper and a drizzle of extra virgin olive oil. * Please note that this is a personal blog and that I am by no means a professional nutritionist, dietitian, or doctor. The information on this blog is purely based on my personal opinion, experience, and research. Yet another quick, one-bowl cake recipe? Yes, because you can never have enough, especially when they involve lots of dark chocolate. But if you have had enough, you will forgive me the next time you have guests coming over and you have to make a last-minute dessert, trust me. This is a trick to have up your sleeve. The only minor catch is that you need a very specific ingredient to make this cake, so be sure to stock up on it when you come across it (as it might not be as easy to get a hold of where you are and it does keep for a very long time). I am talking of chestnut jam, or spread or sweetened puree. It comes under many labels, and there seem to be a variety of preparation methods (some follow a basic jam making technique, others use boiled chestnuts mixed with boiled egg yolks and sugar, some simply puree marrons glaces), but I believe whatever kind you have available should work fine in this cake (as long as you do not buy the unsweetened paste). Crema di marroni or marmellata/confettura di castagne is quite common in northern Italy, an area that abounds in chestnut tree forsets. I know it is also a well-beloved spread in France, so you should be able to find it in specialty stores without too much of a problem. The story of this cake began when, my daughter came home from school one day and exclaimed: "G had the best sandwich today. There was a brown spread in it, but I don't remember what it was called, and it was soooo good!". I enquired when I bumped into G's mother the next day and it turns out it was chestnut jam. After a few weeks of pestering, I gave in and bought a jar. That Sunday, a happy girl sat at the breakfast table, spreading her chestnut jam on a slice of bread. Just that Sunday, I must add. Week end after week end I put the chestnut spread on the table along with our assortment of jams and honeys, and week end after week end I kept putting it back into the fridge. When I opened it last Saturday, there was still that one, lonely dent made by her knife over a month ago. And a tiny little spot of white fuzz in a corner. I gave my daughter 'the speech', how we do not waste food in our household, that if you buy something it has to be used up, etc. I scooped out the tiny fleck of fuzz and decided to prove my point. I remembered a recipe a running companion told me about a few weeks prior (yes, we burn calories and talk about cake). I googled it and came up with a few options. I chose the one with less chestnut jam and more dark chocolate, purely for convenience as the brand we had bought came in a smaller jar. That evening, with guest coming at 7:30, I set off to bake my cake at 7:20. At 7:30 it was in the oven and it was baked at 8:10. By the end of dinner it had cooled, I sprinkled over some powdered sugar and served it. All in all, a good result if you ask me. The cake in itself is pretty grown up*: it is dense, not overly sweet and tastes like the chocolate you used, so choose well. It has a moist, yet chalky texture - excuse the oxymoron, but it is a very difficult texture to describe. It is not a grand cake, although it is discreetly elegant if you ask me (and you could make it grand by serving it with chestnut jam flavored, rum-infused whipped cream). My husband, who wrinkled his nose at the idea of chestnut spread in cake batter and went on to declare he wouldn't have any, managed three slices in a row. Preheat your oven to 180°C/375°F. In a saucepan, melt the chocolate and butter on a low flame, mixing every now and then. In a bowl, scoop out the chestnut puree and then add the butter-chocolate mixture and mix well. This should cool off the mixture, but check that it is not too hot before you beat in the eggs one at a time. Drizzle in a little rum and the two sifted tablespoons of flour. Pour the mixture into a greased and lightly flour-dusted springform pan and bake for about 40 minutes. Let cool, unmold and decorate with icing sugar. *Nonetheless, my kids scoffed most of it. I do not showcase pasta as much as I probably should on this blog, given that I live in Italy and we all love it in any shape or size. The reason is that more often than not, we throw together a pasta on a Friday night, while opening a bottle of wine to unwind, using up the last wilted greens and limp vegetables left in our fridge, and embellishing it with some pantry favorites (tuna, anchovies, smoked pancetta, olives...). No recipe, no amounts, no pre-planning. Just a relaxed, last-minute family meal made even better by the endless possibilities of the whole week end stretching ahead of us. Granted, pretty much all of the recipes I blog about are easy and foolproof, but pasta somehow always just seemed too obvious to write about. That is until I started thinking about all the times I look up techniques or recipes that are extremely common, staples in many households, especially when they are dishes from different cultures. If I look up how to make an authentic curry or how they cook rice in Japan, there must be someone in India or Japan wondering how much to salt their pasta water or how to get their pasta dishes creamier without adding butter or cream. What may be obvious and second nature to some of us, isn't necessarily so for others. Sometimes we just need basic guidelines or flavor profiles to boost our confidence when trying to cook something new. There is no denying that I am super excited about this recipe: a totally delicious dessert/breakfast loaf that is made without white carbs, sugar and butter but is full of hidden antioxidants and vitamins. Plus, I did not have to buy one. single. ingredient. to bake this, I used up a ton of odds and ends I had lying around and the result was loved by all. How satisfying is that? That bunch of shrivelled up, utterly dried-out medjoul dates that I just didn't have the heart to throw away (but that nobody had been eating anymore for a couple of months)? The expensive bag of goji berries I bought out of the sheer excitement of coming across them in a store a few years ago, after reading about them for months? The ones I never really know what to do with (except for mixing them into granola and yogurt) and that, to be truthful, none of us even like? In (but hidden)! And just 10 days before their expiry date! That almost empty bottle of coconut oil that I've had for months and never used until I overused it in a made-up cookie recipe in an attempt to feel less guilty about buying yet another ingredient that would collect dust on a shelf? A recipe that turned out so bad, that I never felt a twinge of guilt again upon seeing the bottle? Finally made a dent in my spelt flour stash, you would think I was a spelt hoarder. And let us not forget the bags and bags of chocolate chips I keep buying whenever I go to the States because I-just-can't-get-that-flavor-dash-size-dash-quality-dash-brand-here that takes up way too much fridge space (yup, that is how long they hang around) but that I never use in an attempt to make my kids reasonably healthy snacks. The result: a whopping banana bread that was dark, dense and incredibly moist. That was so good it was hard to believe there was no sugar (minus the choc chips - that are totally optional), white flour or butter in it. Also, there was no trace of the goji berries, which you already know is a good thing in my book, except for their presumable health benefits (but who knows at this point?). What unfortunately also got lost in the mix were the chocolate chips (except the ones you see on top), so definitely not worth the hidden calories/fat/sugar if you ask me. The dates and bananas totally did their magic without any extra help needed, and I can see myself pairing them over and over again in the future. 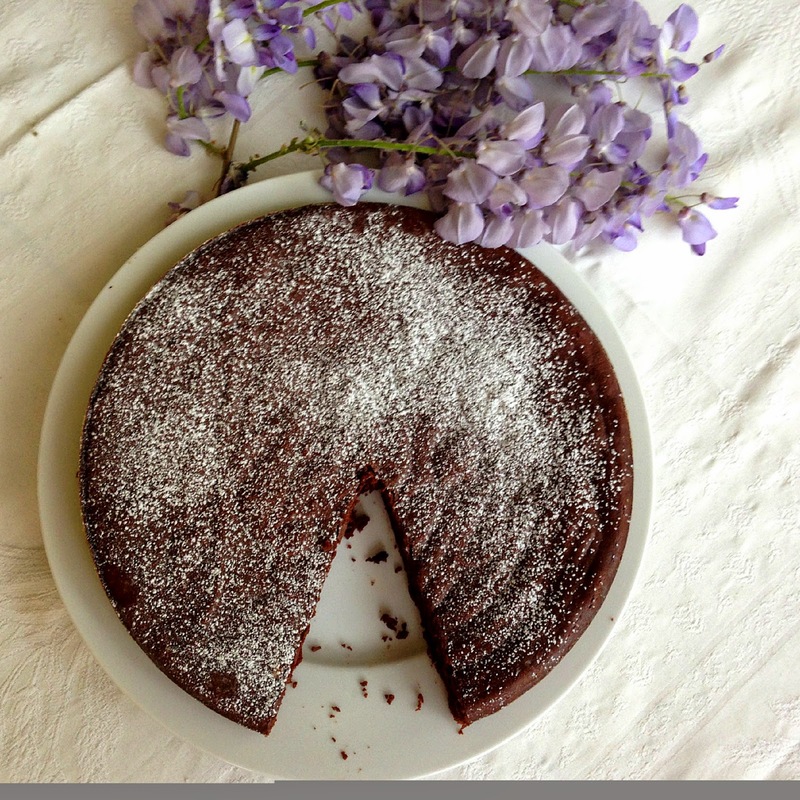 So in the same week, another cake you can bake and eat too... without the guilt! Pit the dates and put them in a small bowl. Heat a mix of water and whisky (or pure whisky if you like) until just simmering and pour over the dates so that they are covered. Set aside and let soak for at least 15 minutes. In a bowl, mix together the flour, baking powder, baking soda and salt. Preheat your oven to 175°C/350°F and grease a loaf pan. When the dates have softened up, blend them in a food processor with as much of the liquid as you need to obtain a smooth, loose (but not too loose) paste (I ended up using all of it). Then add the goji berries, if using, and blend some more. The paste will turn a beautiful shade of reddish brown. Add the coconut oil and then blend in the bananas until just smooth. Beat the eggs into this mixture one by one, then add in the vanilla extract. Fold the wet mixture into the dry mixture, then mix in the chips (if using) until just combined. Pour into the pan. Bake for about 60 minutes, possibly a little longer. Insert a toothpick or a strand of raw spaghetti into the middle: remove from oven when it comes out clean. This post has been a long time coming. There was a quick family trip to the subpolar temperatures in NY (although there was plenty of sunshine and love to warm our hearts while there). Then came jet lag, work overload and, to be honest, also a reasonable degree of laziness. Until a few days ago, when I finally decided to bake a cake that had piqued my curiosity a while ago when it kept turning up in one version or another on some favorite blogs, to finally see it pop up again here a few weeks ago. Of course what originally caught my attention was the concept of boiling a whole citrus fruit and then blending it, skin and all, to become the base of the batter. Now I was further intrigued by the idea of baking with no flour/carbs. And of course, the leitmotif of this blog of mine, the idea of a one-bowl, five-ingredient cake (well six, because I threw in a large, knobbly carrot too at the last minute) appeals to me even more. So we have oranges, carrots, almond meal, sugar (mostly refined), eggs and baking soda. No flour, no butter, no oil. Lactose and gluten free. I tweeked the last recipe I linked back to by using mostly unrefined sugar (unfortunately I ran out while baking this or I would have used only unrefined sugar). I also added that carrot I mentioned above because my orange didn't weigh in at 350gr. Plus, hooray for the extra nutrients and vitamins, right? What I pulled out of the oven was Bundt cake with a very grown up, heady aroma of Christmas Eve and Mediterranean nights and a pudding/flan-like consistency. Don't get me wrong, it has some crumb, but it is moist and dense at the same time, making it hard to decide whether to eat it with a fork or a spoon. I liked it and was perfectly satisfied with the result, although I admit it wasn't love at first bite, and the kids were all "meh" about it (then again I never would have eaten anything even reminiscent of orange zest as a child). But then it started working its magic. My husband and I just kept going back to it again and again, peeling back the aluminum foil, cutting off sliver after sliver of it (the round serving in the photos is purely for blogging purposes, the whole cake and slices just didn't photograph well). Then, on the third day, even my daughter (who does not budge once she has made up her mind about not liking something) asked for another slice, quickly followed by another. Something about the lovely citrus fragrance, the nuttiness, and the texture of the almonds and grated carrot just becomes addictive. A few hours before baking the cake, bring a pot of water to a boil and slowly simmer the orange(s) for about an hour, or until it goes completely soft and you can easily pierce itwith a fork. Drain and let cool. Blend 250gr of peeled almonds until you until reduced to flour, our buy it pre-packaged. Grate the carrot, preheat the oven to 190°C and thoroughly grease a baking tin (I used a bund pan but any kind works -however, keep in mind that a loose base will make it much easier to extract it) with butter. Coat with flour and set aside. When the orange(s) has cooled off, cut into quarters and get rid of any seeds. Then reduce the citrus to a pulp by blending it in a food processor, blender or with an immersion blender. In a large mixing bowl, beat the eggs. Then, beating after every addition, mix in the orange pulp, carrot, sugar, almond meal and the baking powder (and salt, if using). When your batter is ready, pour into the tin and bake in the oven for up to an hour. After about 45 minutes check it by inserting a toothpick, if it comes out clean it will be ready. Otherwise, cover it with some aluminum foil so it doesn't get too dark, and bake a little longer. I tend to be an optimist, I have always been that way (unless we're talking bureaucracy, then I am given to looking on the black side). To me the glass is usually half full, not half empty, if you know what I mean. That doesn't mean I don't have bad days or moments, of course. I most certainly do. Like the other day for example. I could tell you the story this way: the other day I left the office to meet a friend for lunch. We were supposed to meet up with another friend too, but she had to cancel at the last minute because her daughter had a fever. Initially, we thought of postponing the lunch, but then decided to go anyway because we hadn't seen each other in ages. We met in front of her office and had a salad in a café across the street. At 3:00 I had to be somewhere for work until 5:00. Then I had to pick my son up from kindergarden at 5:30, go to my daughter's school to meet with her teachers and get her report card, and pick her up. Stuffed cabbage soup is what you make when you bought the ingredients to make stuffed cabbage only to realise you just don't have the time to go through the whole process (after you have been pushing it off for three days in a row) and your ground meat really needs using up. And guess what? It is just as good (or at least we thought so), very comforting, warming and full of flavor, and can be ready in under an hour, so I knew you would appreciate if I shared. I used potatoes because I had some that were starting to sprout, but adding raw rice (about a cup for the amount below) would probably be more fitting, since stuffed cabbage is often filled with ground meat and rice. Up to you entirely, but make sure you add more liquid if you do this, as rice generally absorbs more than potatoes while cooking. Also, I used pimenton de la Vera because that is what I had and I love the smoky flavor it adds, but using spicy Hungarian paprika - or any other sort - is more than ok since this soup is loosely based on Eastern European stuffed cabbage recipes. The amounts below are just a suggestion, I usually eyeball them depending on how liquid or spicy or meaty I want the soup to be.